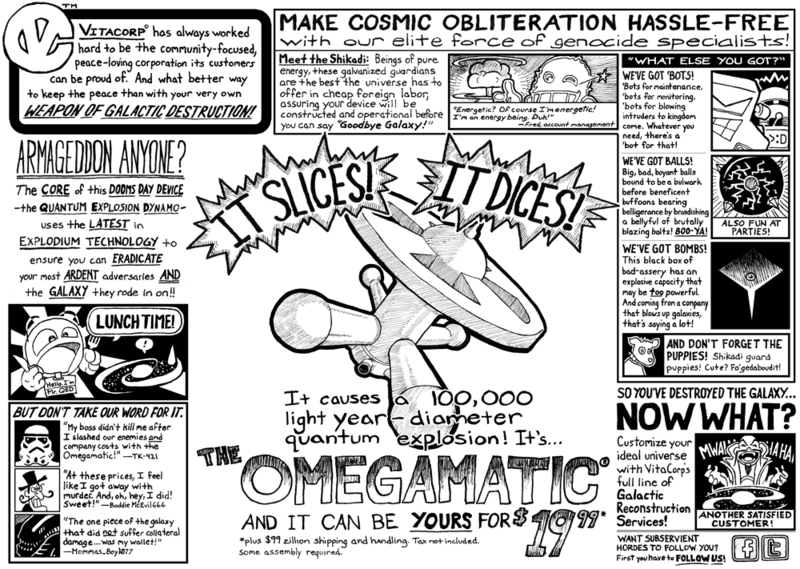 An extended version of the original Omegamatic ad. Note about this one: I originally thought that the company that created the Omegamatic was called “VortiCorp” implying that the Vorticons actually built it. Only after I was 95% done with this comic did I realize it was actual “VitaCorp”. So where I originally had “VortiCorp has always worked hard to be the community-focused, peace-loving company the Vorticon people could be proud of” — a reference to the Vorticons as a peaceful race per the end of the third game — now I had to alter “Vorticon people” to “its customers” which pretty much nullifies that joke. Plus the VitaCorp/VortiCorp logo is supposed to be a slight alteration of the “Big V”, but now is pretty much meaningless. Also, that’s why I refer to the Shikaidi as “cheap foreign labor”. Basically this comic is not nearly as good as it was meant to be. Of course there’s plenty of stuff crammed in this one that hopefully you’ll still get at least some entertainment value out of it. annnd last but not least a Xenomorph.